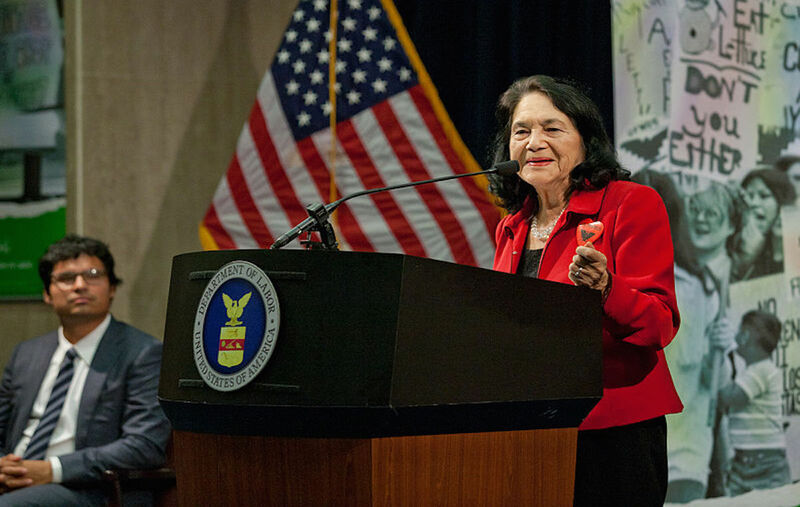 Dolores Huerta speaking in 2012 at the Induction of the Farm Worker Movement into the Labor Hall of Honor in the Great Hall at the U.S. Department of Labor. Actor Michael Peña looks on. At a Thursday morning press call organized by progressive advocacy group People for the American Way (PFTW) to announce an open letter co-signed by 22 Latino celebrities denouncing the “anti-immigrant fear-mongering” of Republican presidential candidates, civil rights icon and PFTW board member Dolores Huerta called for Latinos to display their power at the voting booth and not vote for GOP candidates who have embraced “rhetoric that deeply hurts Latino and immigrant communities.” She also spoke about the current 2016 election. Question from the Associated Press: Dolores, can you address specifically the fact that [Ted] Cruz and [Marco] Rubio are both Hispanic and that either one might become the first Hispanic president. How do you reconcile that potentially historic election with their policies and your denouncement of those? Dolores Huerta: The fact that they’re Latinos and that they have Latino last names, the fact that they speak a little Spanish, does not reflect the fact that they share Latino values. What we look at what they have already said during this campaign, both of them have said that they would not support a path to citizenship. Cruz tried to end the DACA program, which is the executive action that President Obama said that parents of children who are undocumented could remain in the United States and they could get work permits too… [Cruz and Rubio] have both turned their backs on that particular program, and we know that Cruz has associated himself with Steve King, who is one of the most anti-immigrant Republicans in the Congress right now. He’s the one that said something about people having muscles like melons because they were bringing in drugs into the United States. We see that Rubio, who really had a great opportunity when he was in the Senate to do something about immigration reform—instead he walked away from table and he turned his back on the immigrant community. He has also said that he would make it very difficult for people to become citizens of the United States of America. He’s also made very strong statements saying that we have more immigrants coming into the United States, which we know to be that the opposite is true. Immigrants that have come into the United States have actually decreased, especially from Mexico. And then when you look at their other issues, like the minimum wage issue—most of the Latino families are working people, and they come out very strongly against any kind of a minimum wage or workers’ rights. So we can see that both of these gentlemen, Mr. Cruz and Mr. Rubio, they really don’t share the values of the Latino community, even though they happen to be Latinos themselves. Question from NPR’s Latino USA: In condemning all the Republican candidates and saying that Latinos need to go out and register to vote, what are their alternatives? Are you saying that they should go with Democratic candidates or can they vote for other Republicans? What specifically is the point of them voting? Do Latino conservatives vote for Democrats because of this? If you can share more about that? Dolores Huerta: I think we have to vote our values and we have to vote for the people who are standing up for us. We can’t vote for someone just because of a label, of a party. We can’t vote for somebody because they happen to be of Latino descent. We’ve got to vote for the people that are going to stand up for the things that we care about, the things that are going to affect our families. And I think that is the criteria that we have to give to all of our Latino voters. Let’s see where these people [the candidates] stand. Let’s see where they stand on immigration reform. Let’s see what they’ve done in the past. You know when you think of Rubio, who seems to be gaining popularity—but he talks of immigrants are being potential terrorists. And that kind of a label really hurts every one of us, and in that case what’s so sad about all of the Republican candidates is that they’ve all tried to outdo Trump and kind of race to the bottom in terms of increasing the bigotry that they have. So I think that’s the criteria that we have, not what party you belong to so much, but also exactly what are the parties doing for us. I think the other sad thing, as we look over the landscape in my own area, there are some Republicans who have said, “Oh yeah, we support immigration reform,” but they never signed on to the letter that would have been able to take immigration reform out of committee that would have brought it to the floor of the last Congress, so that people… actually it probably would have passed. So we need to really look at their actions and see what they’re doing. The other thing is that all of these Republican candidates that are out there running for different offices—are they denouncing Trump? Are they denouncing the remarks that Cruz and Rubio have been making? Even John Kasich—we haven’t seen him denouncing what Trump is saying about immigrants. So I think this is what we have to look for. Including Jeb Bush, which of course we haven’t really mentioned, if you look at his immigrant policy, he was actually calling for the deportation of 40% of undocumented immigrants in the United States. So that’s a lot of people that he would like to deport. And Jeb Bush has used the word “anchor babies.” I know that because of his fluent Spanish, he’s out there courting the Latino community, but then again when you look and see the rhetoric that he’s also embracing, it’s very similar to what Donald Trump is doing. Follow-up question from NPR’s Latino USA: There are also critiques in the Latino community that parts of the Democratic establishment have not been immigrant-friendly, specifically President Obama as “Deporter-in-Chief,” some of the comments by Secretary Clinton surrounding the Central American migrant crisis and sending kids back home. How do Latinos reconcile all this just in general? Dolores Huerta: The Obama deportation policy, that was kind of a policy that he inherited from George Bush, and it was actually put into a congressional bill that they had to somehow fill I think it was 400,000 beds every single year, in terms of immigrants. But if we look at all of the history of the anti-immigrant rhetoric and the policies of deportation, they actually started with the Bush administration. Again, when you look at what has been held up in the DAPA executive action by President Obama, that has been held up by Republican governors, actually being held up in the courts, and again, it was held up by Republican judges that actually voted not to let it go forward. Again, you have the look at the whole picture. I think that Hillary Clinton, if we look at her policies of the past, she has always been very close to the Latino community and she has come out very very strong in terms of immigration reform. And the one thing we do know about Hillary Clinton is that she is a person that gets things done. She is a person that has that experience and has the ability to make things happen. Of course we also have to remember that the laws are made by the Congress and it’s important that we have to understand that the congressional candidates to the Congress are the ones that ultimately do make the laws. One other point, when we think about this election, we also have to think of the judges—the Supreme Court right now is going to decide what’s going to happen with President Obama’s executive action on DAPA. And it was the Republican judges that held up the implementation of DAPA in the first place. Later in the press call, a reporter from the Latin Post asked this question: This question is similar to a previous one about the Democratic candidates. So Senator Sanders voted against the comprehensive immigration bill in 2007. Secretary Clinton has gone and said the term “illegal immigration” a couple of times, and has gone back and forth regarding deportation and deportation status. What is your feedback on immigration and the Latino records of Sanders and Clinton? Dolores Huerta: Well I think my knowledge is that Hillary Clinton apologized for the use of the word “illegal,” which I know has been very common in all of the press and I know she apologized for that. I do believe that with a Hillary Clinton presidency, that the issues that bring the children that come to the United States escaping the violence in El Salvador and Honduras and some of those other countries, with her presidency, that she will be able to solve those issues in those countries, so that people do not have to immigrate to the United States of America. I have a lot of faith in her policy expertise, again as I said earlier, that she is a person that knows how to get things done. And I do believe that… we need long-term solutions, and when we think of those immigrant children that have come escaping violence to the United States, we know that a lot of that stems from a previous policy that we had in the country, and I do believe that a Clinton presidency will be one that will be so expansive, that she will be able to solve the problems in Latin America, which we should have done a long time ago since we created a lot of instability, especially in places like El Salvador and Honduras—that we will not have to see that in the future. And that the children and the families… and we know that some of these policies that are in place, these immigration policies, are preventing them from getting the kind of asylum they need. We have made it very difficult and we have got to change those policies so that people that do deserve asylum will be granted that asylum. From Latin Post: Any comment regarding Sanders? Dolores Huerta: I think Mr. Sanders in his defense, he voted against that bill, but it was mainly many immigrant rights organizations like Southwest Voters, LULAC… these other organizations that were actually asking Mr. Sanders to cast that vote. Unfortunately, I don’t think these organizations really understood the political process. I for one myself and many others were saying, “Look, the bill was in the Senate, it could have come to the House, we had a Democratic majority in the House.” I think the bill could have been cleaned up, and we could have gotten… it was probably a better bill than the one that was in the last Congress, and unfortunately [Sanders] kind of conceded to these immigrant rights organizations and he probably should have studied the bill and be a bit more informed, personally on the whole immigrant rights issues, because I think we could have gotten a good bill out.